Ok… so this week got thrown to the wind, and not because of the holiday, I stayed home for Thanksgiving, but because of what I was doing last week. I was moving into a new townhome and was back and forth between the new place and the old place all week long, the gym was the last thing on my mind. Plus after the race-apocolypse on Saturday I probably needed a break anyway, but I did manage to toss some workouts in late in the week. Here’s the numbers, for what they are worth. So this is the end of the “official” 5K training course, even though I already ran the race. The half marathon trainer starts tomorrow. The mileage will start kicking up. The milage for week one and two (which I will do 4 times as mentioned in the last post) is 3-3-4, 10 total miles. With the optional 2 mile run on Wednesday, but I believe I will use that for cross training instead. Monday starts my Half-Marathon training course in preparation for the Rock and Roll Half Marathon in New Orleans on March 4, 2012. 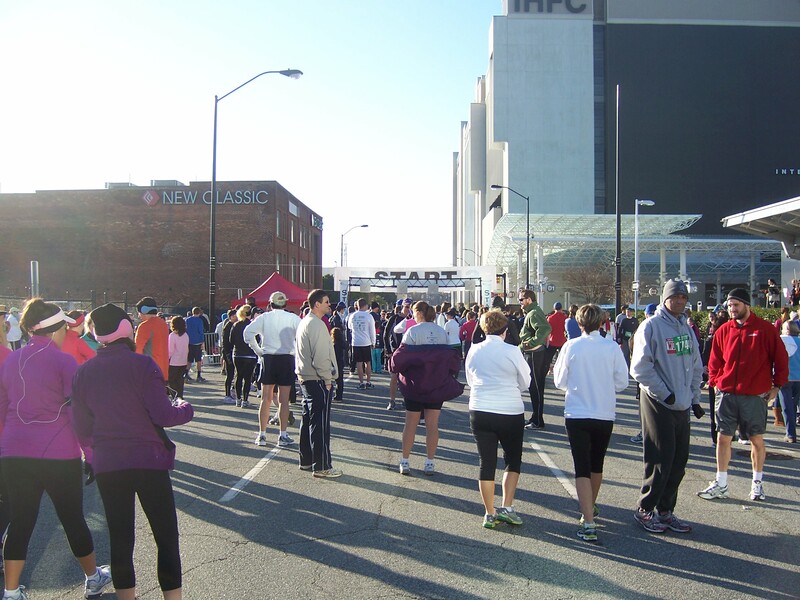 I am following the Hal Hidgen Novice Half Marathon trainer. This is a twelve week program, and since I have 14 weeks between now and the race, and to help ease me into my first long distance trainer of any kind, I will be completing Week 1 three times, before advancing to Week 2 and continuing with the schedule. This schedule also changes my workout days from the 5K trainer I was following. Now, rather than running Mon, Wed, Fri to prep for a Saturday race, now I will be running Tues, Thurs, Sun to prep for a Sunday race (with an optional run on Wed). Here’s what the weeks will look like with the week 1 distances. Week 1 and 2 are the same, Week 3 and 4 are the same and then the distances increase each week. Sunday’s will always be the longest run of the week. I can already see some places where I will need to make adjustments, but the good thing about the Hidgen trainer is it is very flexible. Christmas Day will be a Sunday this year, so I will have to do my long run on Saturday. 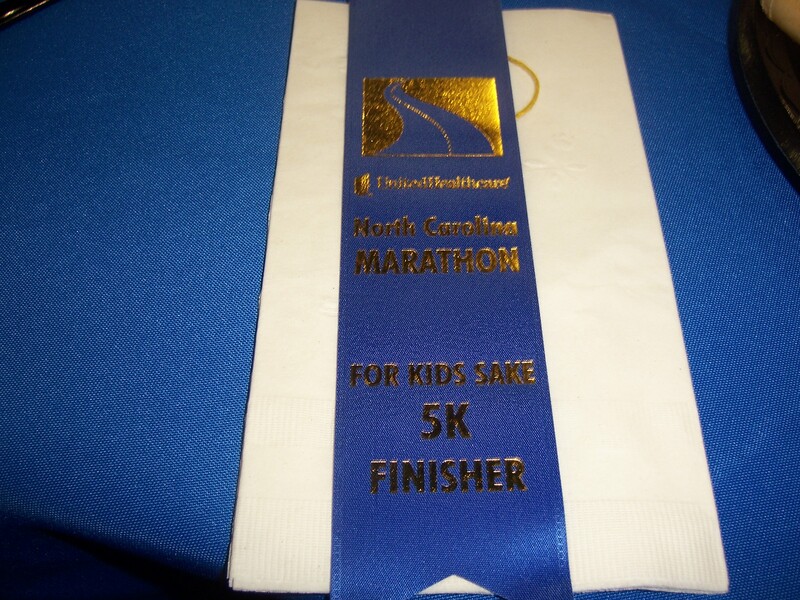 Also, New Years Day will be Sunday, and I will be running the midnight 5.5K race that night. But the Higden trainer has spots for races in the training, so I will be doing the 5.5K week 3 instead of week 6 and just adjust down the other long runs. Week 9 has a 10K race, but I’m not sure if there is one scheduled that weekend. I would like to do a 10K before the half, but there’s not a lot of races scheduled this time of year. This is what I will be doing for the next 14 weeks. Can’t wait for New Orleans! I hope by then I am ready! 1 cup of 2% low fat Mozzarella cheese. Place a pot of water on the stove to boil and pre-heat the oven to 350 F. Once the water is boiling, pour in the pasta and cook per the package directions. While the pasta is boiling, brown the ground turkey in the pan. I didn’t have any salt and pepper to add, but I added a small amount of garlic salt. 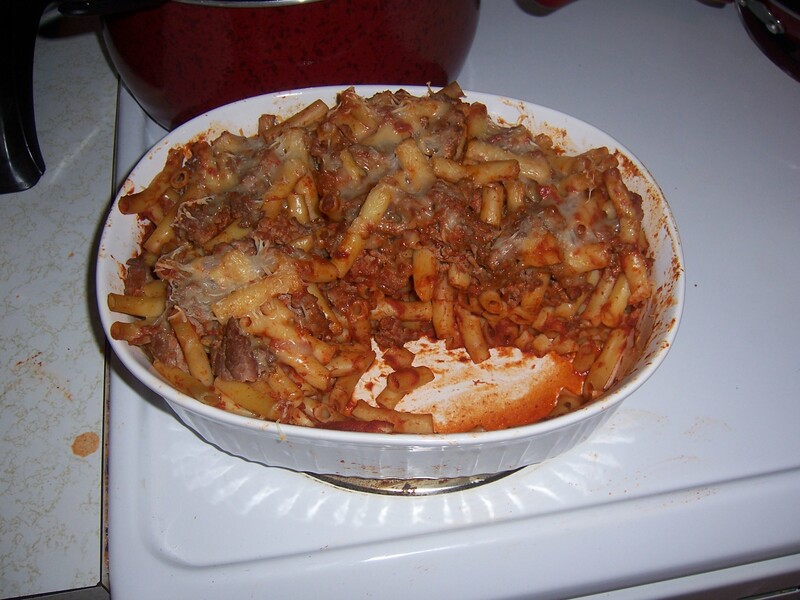 When the pasta is done, drain the pasta in a colander and then pour into the baking dish. Open the jar of sauce and pour over the pasta and stir to combine. When the turkey is cooked, drain the turkey in the colander as well. (Optional with such a small amount of fat, but I did drain it). Add the turkey to the dish and mix it in as well. Sprinkle the mozzarella over the top of the dish and place in the oven for 10-15 minutes to melt the cheese and warm the sauce through. That’s it. Told you it was easy. Enjoy. Even with a side salad (with cheese, croutons and dressing) and a slice of garlic bread, the whole dinner is under 1000 calories. Couldn’t find my camera until I had already eaten two servings. I seriously was not going to write a blog about this race. I was either going to not write at all, or do a picture only recap. But.. 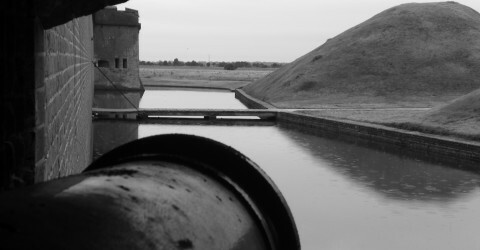 I thought about it and decided it might be cathartic to write about it. Needless to say, I was NOT happy with my performance. And the administration of the race was crap as well. The weekend started off on the wrong foot as I went to the race location to pick up my race packet. The packet pick up was fine.. I got my number bib and my bag, which was nice and my tshirt, which of course was a XL. But it should fit soon, but I won’t wear it since it says NORTH CAROLINA MARATHON across the front and I didn’t run the marathon. But then I asked the lady where to go to the expo, since I wanted to look at some long pants and maybe a hat/ear warmer or something since it was going to be cold as all heck the next morning. And she was like.. “Oh the expo is not tonight.. it’s tomorrow (DURING THE RACE)… they changed it at the last minute…” Wha?? So I stopped at target to get some pants on the way home. Race day started out well enough. Got to the venue in plenty of time. Was able to wait indoors so I wasn’t freezing my tail off. Cheered on the start of the Marathon/Half Marathon. After that I stayed outside (it had warmed up), walked around to warm up and drank my Gatorade Prime… then it was time to line up for the 5K start. After this point it all goes downhill in a hurry. Ok.. so I finished. But as I glanced at the clock I saw red. 44:12. A mere 43 seconds faster than my previous best. Yes, it’s a PR (personal record), but after 7 weeks of intense training I expected myself to do a lot better than “just finishing”. I was mad. Mad at myself. Mad at the weather. Mad at the course.. mad at everything. 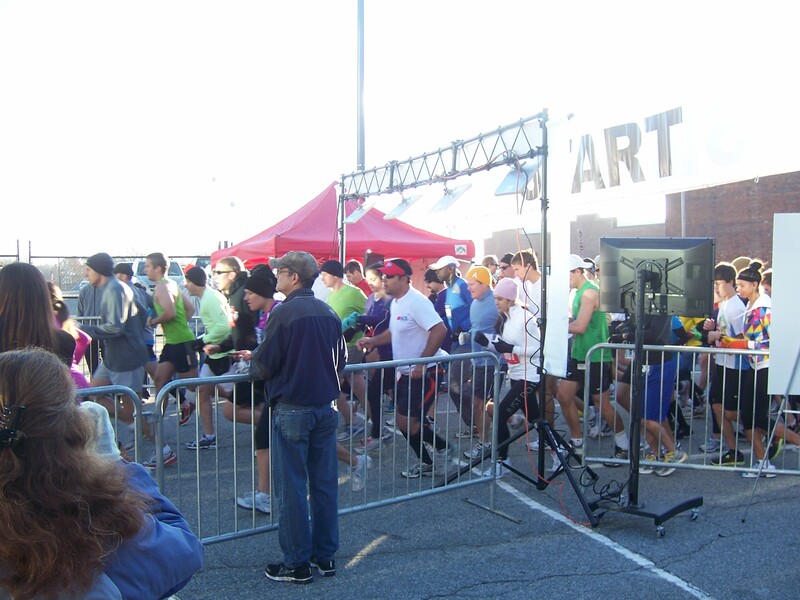 Then came the post race expo, the free food and the free beer…. wait… the beer’s not free? The food is bagels and apples, and the expo center is empty? What the frell? This is a marathon right? 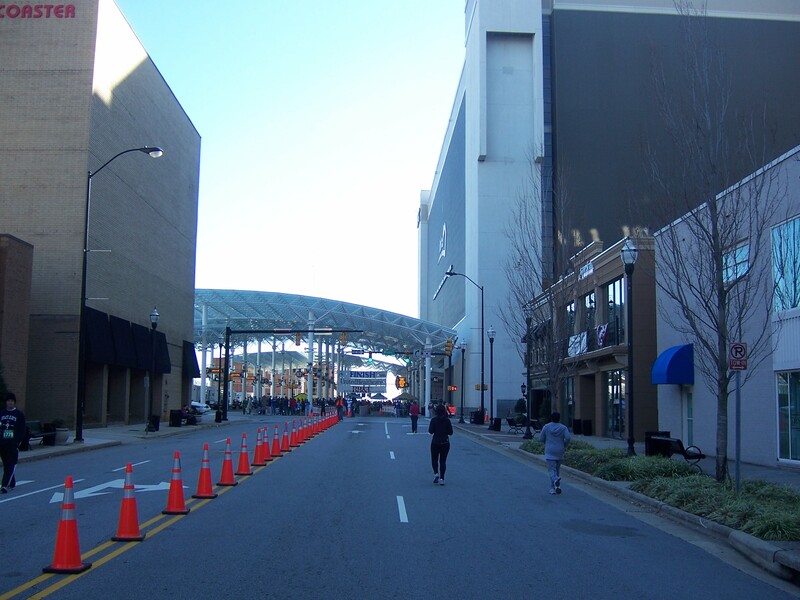 This is THE North Carolina Marathon? You have got to be kidding me. So the best part of the race was that I had finished it and it was over? Nice. At least I got a nice ribbon. I won’t lie. I was so pissed off and so disappointed I sat in my car in the parking lot and cried. I felt like the training was worthless and it didn’t help me, and I felt like running the race just proved I was fat and slow and would never be a “runner” just a “finisher”… I also had 2 or 3 weeks of other stress crashing down on me. Like I said, it’s a miracle I even started the race, and a bigger miracle I finished it. But that doesn’t mean I have to like it. The time says it’s my best race. The experience was the worst. 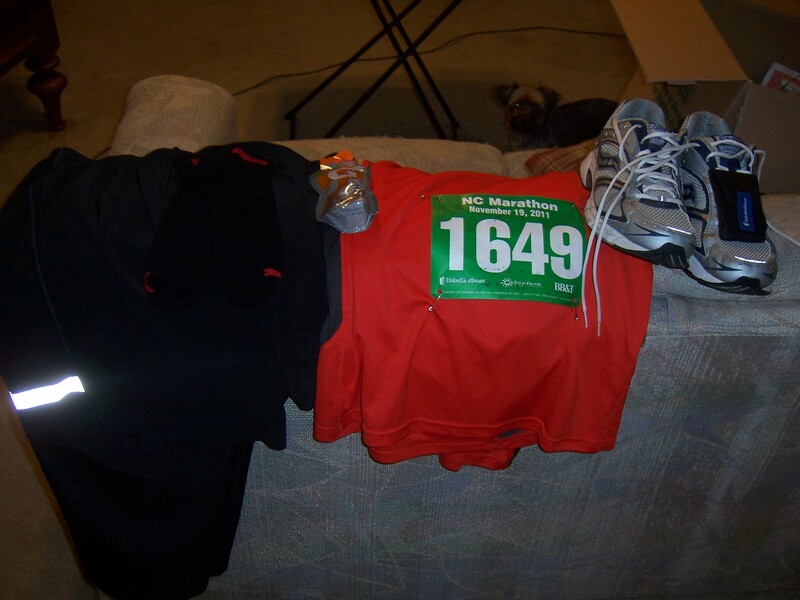 I know it’s only a 5K.. but I have to drive a little ways to get there, and since I will need to get into the habit for longer races (when i will need to pack things like Gu and water and other things) I laid my gear out tonight so it will be ready in the morning. Come back tomorrow for the race recap! So, I got some new gear today. 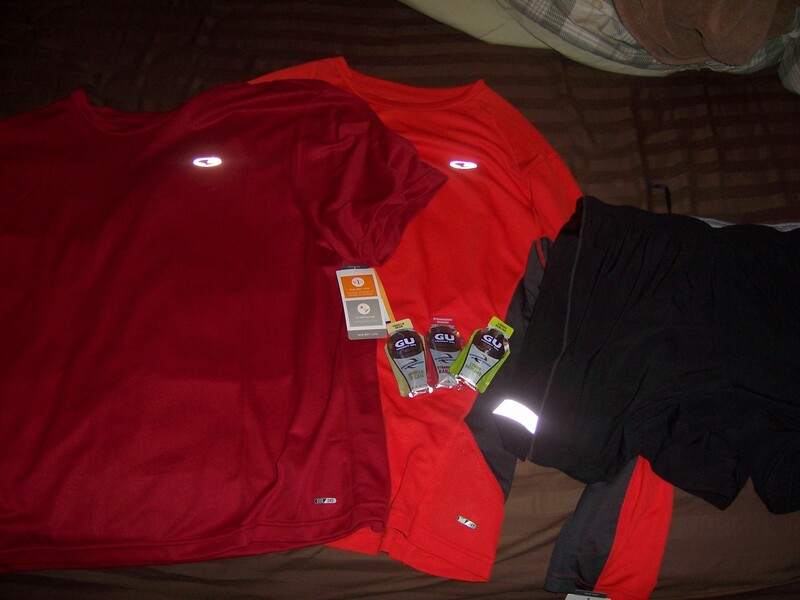 Real running gear. I just couldn’t take it anymore to work out in a too-big 3X tshirt and heavy mesh basketball style shorts. I was soaking in sweat and getting overheated. So first I went to a real running store Fleet Feet Sports here in Winston Salem. I looked at shorts and shirts and tried on some different brands and different sizes. I’m at that nice awkward between size stage where a 2X is starting to be too big, but an XL is still too small. The XL shorts were WAAAAY too small. The 2XL shorts felt too small since they are tighter on the legs and I’m used to loose, but as far as waist size they fit fine (the tight on the legs is just a mental thing). So I got a pair of Nike Dri Fit shorts.. I think around a 5 inch length.. not SHORT short, but not knee length.. kinda inbetween. They were a little more expensive but well worth it for honest running shorts, since the shorts are target were just more of the same basketball style I have now. I tried on several shirts but couldn’t find one I liked, the Nike 2X (the only one in 2X) seemed too big, but all the XL shirts from Nike, Asics and Brooks were too small, the Brooks I could barely get into. So off to Target. Thanks to a great recommendation from Amanda who told me I could find Champion gear at Target, thats were I went looking for shirts and found just what I needed. I tried on the 2X long sleeve Dry Duo shirt and I liked the way it fit. I also had an adventure trying on a 2X compression top, that I didn’t realize was compression until I had it half way on.. it was like trying to squeeze into an extra small.. 2XL my left leg. I managed to find another Dry fit style in shorts sleeve and now I’m set for a while. Long sleeve for outdoors, short sleeve for indoors. I also got three packs of Gu to try. I’m not yet running long enough distances to need the mid-run nutrition, but I wanted to try a couple of flavors, and to see if I can handle the texture of what is basically pure sugar in gel form. I got Vanilla Bean (Amanda’s favorite), Strawberry Banana and Lemon Sublime. Also, at the grocery store the other day I got one of the “pre-workout” Gatorade Prime’s to try. I know I likely won’t “notice” a difference or anything (but if I do that will be awesome) but I plan on drinking it before my race Saturday morning. Turkey.. The Other, Other White Meat. So, I was feeling a little adventurous today at the grocery store and I picked up a 1 lb pack of Jennie O Ground Turkey. I got some other nice healthy stuff too that I will probably talk about later. Like Kashi GoLean Crunch cereal. The reason I even thought of ground turkey was that I saw someone on MyFitnessPal who had made spaghetti with ground turkey and thought that sounds pretty good. So of course I’m on the way home and I think to myself… Now what am I going to do with it? Well I decided to make tacos with it, and they were very good. Couldn’t tell it wasn’t beef honestly. So that led me to the question.. is it healthier than lean ground beef? Obviously it’s a lot better than the cheap stuff I used to buy (80/20 or 85/15), but it appeared to be very similar nutrition wise to the 90/10 ground beef. Ah, but as always those looks can be deceiving. What looked similar calories and fat is thrown off by the fact that the ground beef is a 3 oz serving and the ground turkey is a 4 oz serving, so you have to adjust one or the other to make the one to one comparison. For simplicity I will adjust the beef. I’m assuming the major difference will be in the fat content so I looked at Fat/Sat Fat and cholesterol. So besides the higher protein in the beef, the turkey wins hands down. Lower cal, lower fat, lower Sat fat, lower cholesterol. And it was tasty. And it was about the same price as the 80/20 ground beef, and cheaper than the comparable 90/10 or 93/7 ground beef.